Heather Ordover knows her literature; the teacher and host of Craftlit Podcast has been helping knitters “Stick a Book in [Their] Ear[s]” for 274 episodes! With her at the helm, this collection brings together designers inspired by literary figures from doomed lover Isolde to brave heroine Little Red Riding Hood to form-shifting Dr. Jekyll. The tone of What Would Madame DeFarge Knit blends a deep love of the classics with a modern, irreverent spirit. While some designs, like Jane’s Ubiquitous Shawl, play it pretty straight with a historically-influenced lace pattern, others, like Frankenhood, offer a tongue-in-cheek project complete with light-up neck bolts. With 21 accessory and garment patterns from socks to wraps to reversible cowls, there’s plenty to satisfy almost any knitter. My favorite is Chrissy Gardiner’s Wilhelmina Shawlette, a captivating triangular lace confection inspired by the heroine of Bram Stoker’s Dracula. Heather and her contributors don’t confine themselves to knitting, tossing in a crochet pattern or two, a number of recipes, such as for spicy pumpkin soup, and related craft projects, like cutouts for a full shadow-puppet reenactment of Peter Pan’s Mermaid Lagoon, inspired by Victorian family amusements. 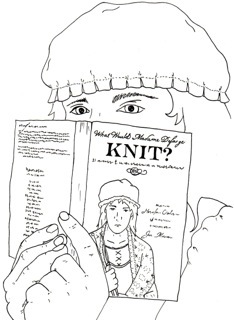 The book purposefully remains black-and-white, with woodcut illustrations; it works well to look up the patterns on Ravelry as you go to see the projects in their colorful glory. If you’ve ever been moved by words in a book, had a crush on a literary character or spent time mentally decorating Pemberley, this volume will speak to you. Thanks to the generosity of the folks at Cooperative Press, we have an electronic version of the book to give away! The Random Number Generator will pick a pattern Monday morning, March 4th. 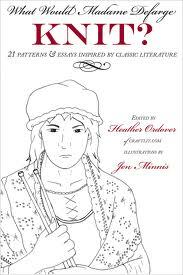 And Heather’s inspiration doesn’t stop with one book; watch for the companion volume, What (Else) Would Madame DeFarge Knit to hit shelves next month!